Borrego Springs is perhaps one of the best kept secret holiday spots on the entire planet. It has unique character and offers a range of amazing activities and fun you won't find anywhere else. In fact, it is not uncommon for many to schedule a trip to Borrego Springs for only a few days, and then once they experience Borrego wish they could stay for a few weeks! Among the many amazing things to experience in and around Borrego is Anza Borrego Desert State Park. This quaint little city is surrounded by the 600,000 acre park, the biggest State Park in the entire country! Borrego Springs offers a whole range of fun activities and is sure to have something for everyone. You could spend weeks discovering all the amazing things about only Anza Borrego Desert State Park. Experience the fun, adventure and excitement of Borrego Springs! Borrego is popular for many reasons and among them are the mild winter temperatures which keep the climate very comfortable during the day and at night. Even during the summer when temperatures can significantly rise, humidity levels are relatively low compared to most areas which helps keep things comfortable when you are out and about exploring all the fun Borrego has to offer. 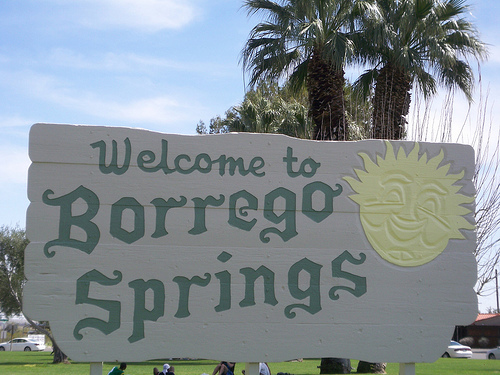 The actual town of Borrego Springs is small with a population of around 2,500 people. This gives the area a small, friendly and comfortable feeling you won't find at many other holiday destinations. Don't be surprised if the locals are quick with a smile, a greeting and take the time to get to know you. This is normal in Borrego where "everybody knows everybody" the feeling is quite obvious. One thing is for sure, you will find yourself right at home in Borrego Springs. Only spending a few days at this magical desert oasis isn't near enough time to experience all it has to offer. The range of accommodations offers something for every budget. There are very inexpensive hotel rooms available for those on a tight budget, four star resort style properties if you need a little pampering and everything in between. For nature enthusiasts, the possibilities are almost endless. Miles of hiking trails give you a behind the scenes look into desert wildlife, biking routes for hours of exploration and even desert tours with overnight options are available. There are also some fantastic night time tours that highlight the magnificent display of stars in the sky and give you a view like no other place on the globe. If you can't imagine a vacation without access to a golf course, then you are in luck. You won't have access to only one golf course, you can choose from Borrego's five golf courses depending on exactly what you style of course you desire. If you decide to play only one course or all five you will be surrounded by amazing mountain and desert views from every tee. If you enjoy shopping there are various venues available that will offer you hours of enjoyment. Among the most interesting is Tumbleweed which offers a unique shopping experience for those interested in authentic jewelry, arts and crafts. The store offers many items from authentic Mexican and Guatemalan craftsmen as well as an entire range of other unique products for sale. It wouldn't be surprising to spend a whole day enjoying the unique Tumbleweed shopping experience without making it out to any of the other fantastic venues. Borrego Springs is packed with a mix of unique experiences, activities and views like no other holiday destination in the world, it's not surprising people want keep it all to themselves. However, now that you know just a little about the magic Borrego Springs offers, take a few minutes to explore the other pages of our site for more information about Borrego and start planning your trip today. It will be a vacation you and your entire family are sure to remember for years to come and you are likely to keep coming back to Borrego Springs for more! We look forward to seeing you in Borrego!